My major research interests are how and to what visual modalities color information contributes. For this goal, I have worked on the following four issues with serveral approaches and techniques. I have been interested in temporal properties of the chromatic opponent channels, and I carried out psychophysical experiments on them with the use of LED-base optical systems I developed. I found there was no different of temporal properties, such as a temporal resolution, between the two opponent channels. (Uchikawa & Yoshizawa, 1993; Yoshizawa and Uchikawa, 1997). Moreover, we found very interesting brand-new characteristics of a temporal property at a high luminance level of stimulus that activates exclusively one opponent channel. In the conventional knowledge of temporal impulse response of the opponent channels, it has been modeled as a low-pass type. Our results however showed the temporal impulse response function was a filter composed by two low-pass filter functions with a delay, but not just a simple low-pass filter (Yoshizawa and Uchikawa, 1997). In an ongoing project of the temporal properties of the chromatic opponent channels, I have investigated temporal properties in each cortical site with a brain imaging technique using MEG, in order to establish a whole temporal property of the entire chromatic system. Chromatic motion mechanism (top) I carried out psychophysical studies on color motion mechanisms. Conventionally, it has been believed that chromatic information does not contribute to produce motion signals. This is because the motion centers in the cortex, such as V1 and MT, have a broad and flat spectral sensitivity and the color center, such as V4, has a low temporal resolution, therefore no site can use a motion signal defined by chromatic change without luminance change in time and space. However, some studies indicated color information could solely code signals for motion perception and they gave rise to arguments on the conventional thought mentioned above. Since then, I have worked on this issue in psychophysical, physiological and brain imaging approaches. We measured performance of direction discrimination of motion of a simple sinusoidal grating (first-order chromatic stimulus) and a chromatic contrast modulated grating (second-order chromatic stimulus) that both were composed by counter-phase red and green components. We also tested the performance of a luminance grating and a contrast modulated grating. We found that the first-order chromatic motion was mediated by a luminance system because the performance of the first-order chromatic motion was susceptible for a dynamic luminance masking noise superimposed. Whereas, the second-order chromatic motion was mediated by a genuine chromatic channel (Yoshizawa et al., 2000, 2003; Mullen et al., 2003; Michna et al., 2007). Our findings gave rise to questions of how such a little luminance change can code motion signal and of what characteristics of a mechanism can mediate the second chromatic motion. My hypothesis for the first question was that there must be cells that can code motion signal with basis of both chromatic and luminance change for compensation of the little luminance signal. For the second question, I have a hypothesis that V4 cells analyze the chromatic change in sequence and then MT cells can produce motion signal by using these signals received from V4. To clarify the first hypothesis, I changed an approach from psychophysics to physiology I worked on monkey physiology to find V1 cells sensitive to both color and luminance, especially the y/b opponent color. Since the previous study found the V1 cells sensitive to both color and luminance changes (Johnson & Hawken, 2001), my prediction was that there might be V1 cells sensitive to both color, especially y/b modulation, and luminance changes. This is an ongoing project; we cannot have enough physiological data of it yet. To test the second hypothesis, I have been investigating on the second question with the brain imaging approach. At this moment, my colleagues and I have measured temporal responses in a specific time and in a specific location of the human cortex. In third, I am interested in a recognition system of three-dimensional structure of visual objects. Human retina can get two-dimensional images, not three- dimensional ones. Therefore, our recognition system, in principle, has to produce information of three-dimensional structure of objects from the two-dimension retinal images. This ill-posed problem causes ambiguity of three-dimensional structure. I investigated on this ambiguity in the structure-from-motion (SFM) stimulus. I found that relative luminance of moving dots of SFM to a background, which maybe be saliency of objects to a background, determined information of a depth order. That is, salient and/or high contrast dots appeared to be in front. This cue is important information to rule three-dimensional structure and robust to other parameters of the stimulus, such as a number of dots and a size of a stimulus. Furthermore, this featured stimulus with this saliency can induce three-dimensional structure of surrounding SFM stimulus that is ambiguous in depth order. 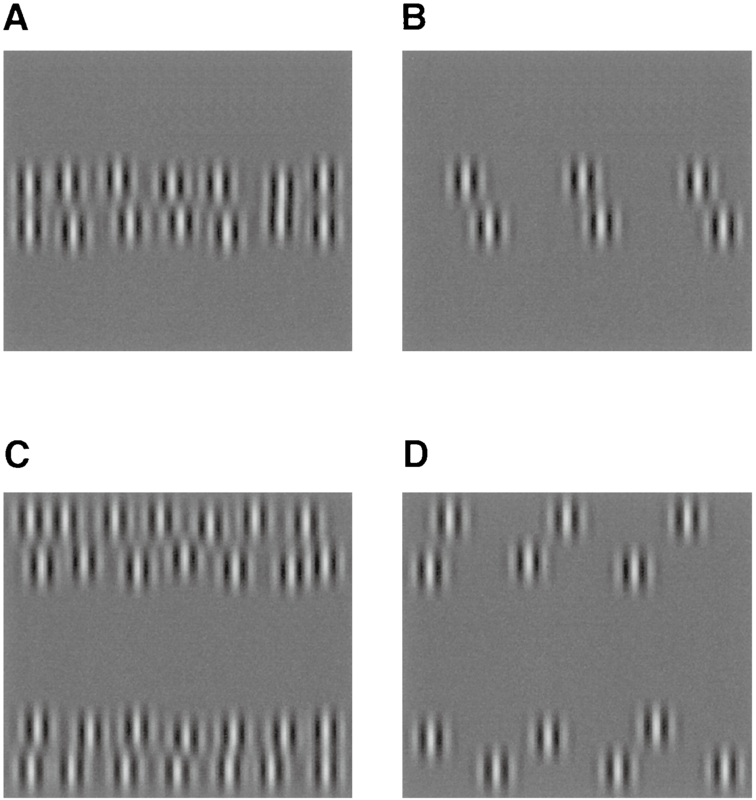 This indicates the saliency has also a key role for contextual perception (Yoshizawa et al., 2006, 2007). Moreover, I have tackled to elucidate a mechanism of the biological motion (BM) perception. There has been some debate as to the relative dominant cue to determine this perception: one is a form cue, and another is a motion cue. Most of the studies on this issue have tried to change parameters of the point-light BM stimulus and/or modify the stimulus in order to solve this problem. Because of changing or modifying the stimulus per se, different results were obtained on the base of different stimulus configurations. I therefore used a unique technique to extract crucial information in the BM perception. I superimposed a BM stimulus on the back-scroll illusion (BSI) background and changed a size and a location of the BSI background. The BSI is a phenomenon that for a movie so that a person makes a treadmill step against a counterphase grating background, we perceive that the counterphase grating moves toward the opposite direction of the walking person at the treadmill. This illusion was robustly observed with a point-light walker, as well as the case of a walking person in a movie (Fujimoto, 2003). If a motion cue is dominant and crucial to the BM perception, discrimination performance of the moving direction of a point-light walker should be changed by a size and a location of the BSI background. Whereas, if a form cue is more dominant than a motion cue, the performance should not be changed. It is because observers in our experiments could see a pint-light walker stimulus during the whole stimulus presentation time and could get form information. Our results showed that the performance was dependent of a size and a location of the BSI background. 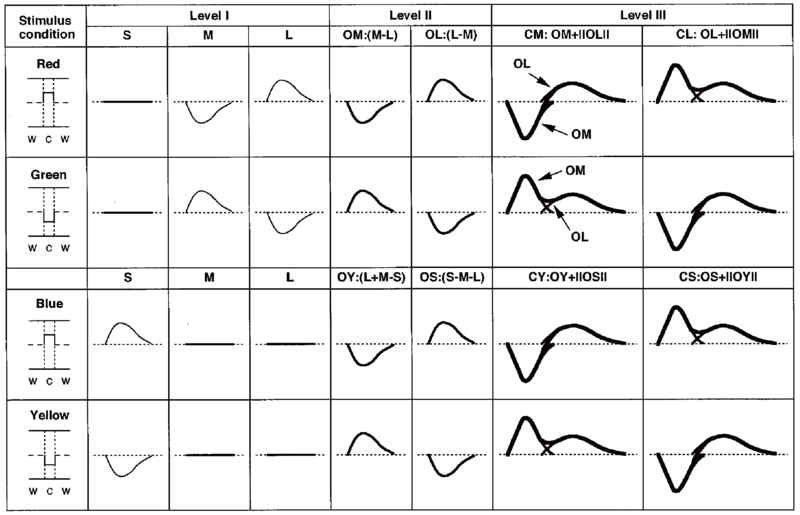 This indicates that a motion cue is dominant and crucial to the BM perception (Yoshizawa et al., 2009). Based on this finding, I would like to investigate each role of motion and form cues, its interaction and relationship between the cues in the BM perception mechanism to understand a mechanism for three-dimensional structure perception. I have been investigating on a contribution of color signal to binocular vision. As well as the issue of color and motion, it also has been a long controversial issue whether color signal contributes for the stereovision, especially to code binocular disparity information. Previous studies by Simmons and Kingdom (1994, 1995, 1997, 2002) showed the contributions of color signal to binocular vision, whereas, for instance, results of Krauskopf and Forte (2002) study were negative to this contribution. Because these studies focused only the r/g opponent channel, but not the y/b channel, I tested on this issue of the y/b channel. It has been widely believed that the y/b opponent channel does not feed any signal to code luminance; therefore our approach was very suitable to solve the controversy. I found that the y/b signal could contribute to code the binocular disparity signal, even though the s-cones are sparsely distributed in fovea (Yoshizawa et al, 2008). I have been still investigating on the residual problems of the issue in psychophysical approaches.